Better Buy: Fitbit Inc. vs. Garmin Ltd.
Stacking the No. 1 and No. 4-ranked wearables sellers against each other to find the smarter bet for investors right now. Wearable tech is a hot growth industry -- sales jumped 70% last quarter according to research company IDC. Fitbit (NYSE:FIT) remains the undisputed market leader, though its dominance is shrinking as competition spikes. That shift has contributed to an epic collapse in its stock price. Garmin (NASDAQ:GRMN) was one of the companies that outgrew Fitbit in Q1 with a healthy 28% sales improvement. So, should investors prefer the steadily growing GPS giant's stock over the much cheaper wearables specialist's shares? Sales growth is for the past complete fiscal year. Data sources: Company financial filings and S&P Global Market Intelligence. Fitbit's growth pace is trouncing Garmin's on account of its formidable first-mover status. Sales doubled last quarter, capping a year in which Fitbit delivered 8 million devices to consumers. Garmin, meanwhile, posted a slight decrease in sales as growth in its fitness segment wasn't nearly enough to offset losses in the auto division. GRMN Revenue (TTM) data by YCharts. Yet on profits, Garmin has its specialized rival beat both in raw earnings power and profitability. 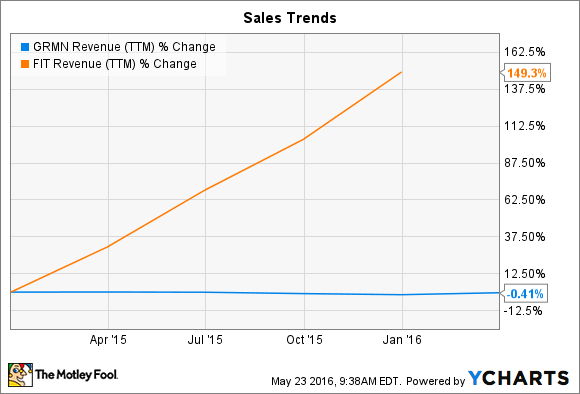 Its gross margin is far higher, and its $500 million of annual net income is nearly triple Fitbit's. What's more, because Garmin generates a substantial portion of earnings from other product categories such as aviation and outdoor sports, it's less likely to suffer from an overall loss if a single device launch doesn't pan out. 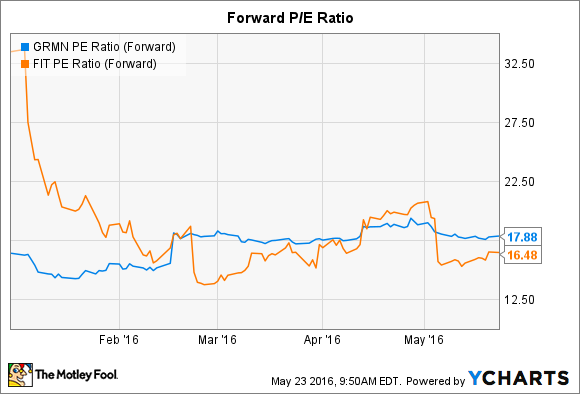 The earnings outlook isn't especially exciting for either company. As the industry expands and matures, Garmin and Fitbit are being forced to pour cash into research and development, advertising, and price cuts to protect their market positions. As a result, investors can expect operating margins to decline. Fitbit recently warned shareholders that it is ramping up spending "to accelerate the pace of innovation to deepen its competitive moat." The recent expensive and logistically tricky launch of two global products at once, the Blaze and Alta, went well. Still, the slipping market share result demonstrates that Fitbit must continue raising the bar before it can call its market position secure. Likewise, Garmin's gross margin fell last quarter as it sold a bigger mix of lower-priced activity trackers and plowed cash into R&D and advertising. The company had little choice but to attack the growth sector. "We believe these investments are strategically important in order to maximize the long-term opportunities in the fitness market," CEO Cliff Pemble told investors in an April conference call. Those shifting market dynamics help explain why investors have turned so bearish on Fitbit's stock lately without changing Garmin's valuation by much. Sure, the GPS device maker is expected to produce zero sales growth this year while Fitbit's base soars higher by 40%. However, its diverse product line lessens the risk to the business from a single flopped device launch or a general slowdown in the industry. Income investors also see plenty to like about Garmin's 5% dividend yield. GRMN PE Ratio (Forward) data by YCharts. If you're shopping for pure growth, you shouldn't write Fitbit off just because its profit outlook is weak right now. After all, its latest device launches are doing just what management hoped they would -- raising average selling prices to a new high. It's just that to prefer this stock right now, you have to balance that success against the execution risk involved in Fitbit's defending its leading position against new and established rivals. The potential payoff for investors is huge, especially after a 50% stock drop since its IPO last year. Yet Fitbit has the most to lose from unfavorable shifts in the industry.